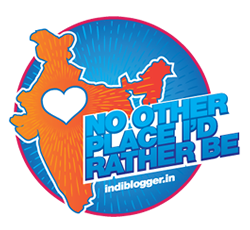 A few day back I shared my Valentine Special DBC cake recipe and had used eggs in that amazing chocolate cake recipe. However, as anticipated and per the theme of my blog, many requested for a moist eggless homemade death chocolate cake recipe. Never knew that the volume of the request will be this high and I will be prompt to make my second eggless chocolate cake recipe in quick succession. When I get such requests, I feel blessed as they all show their love and trust on me to try my recipes. 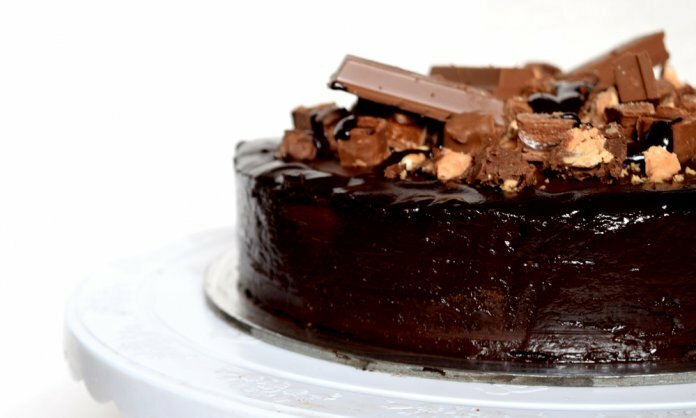 Therefore, on popular demand and following the theme of my blog, I am sharing the moist eggless chocolate cake – homemade death by chocolate cake recipe. For this recipe, we need to first make the Chocolate Ganache. Take fresh cream in a non-stick pan and bring the cream to boil. Switch off the flame and add chopped chocolate to the hot cream. Stir it and add butter. Mix everything until chocolate completely melts. Transfer the prepared ganache into a bowl and let it cool completely. TIP: Always use a Conversion Table to measure your ingredients. Every ingredient and its quantity has its importance in getting the perfect recipe. In a bowl add condensed milk, oil and vanilla essence and mix all the wet ingredients. With the help of a sifter sieve flour, baking powder, baking soda, cocoa powder, and salt. Gently fold all the dry ingredients into wet ingredients. Add milk to the batter to make it of pouring consistency. Add vinegar to the batter and keep it aside for 5 min. Meanwhile, keep your oven for preheating at 180 °C. 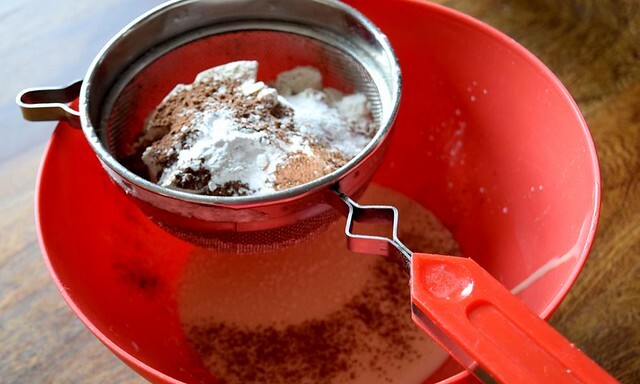 Tip: If you want a light and fluffy cake, do not skip sieving your dry ingredients. Sieving not only helps to remove unwanted particles from the flour but also aerates the flour that helps to raise the cake when in the oven. Grease an 8” round cake tin or line it with parchment paper for easy demolding. Prefer using parchment paper against butter paper or wax paper for better results and to avoid disasters. Pour the prepared batter into the cake tin and bake it in a preheated oven at 180 °C for 25 minutes or until it passes the toothpick test. Note: Time to bake the cake can vary depending on size and temperature of your oven. So to bake a perfect cake it is very important to know your oven first. In my Murphy Richard, it took 25 minutes to bake this cake. When the cake is baked, take out the tin from oven and let it rest for 3-5 minutes before demolding. After demolding let the cake rest on cooling rack for minimum 1 hour. After the cake has cooled down, cut the cake horizontally into two equal halves. Place one piece of a cake board. Apply a layer of prepared ganache. Sprinkle finely chopped chocolates on it evenly. Place another layer of cake on it and pour chocolate ganache on it. 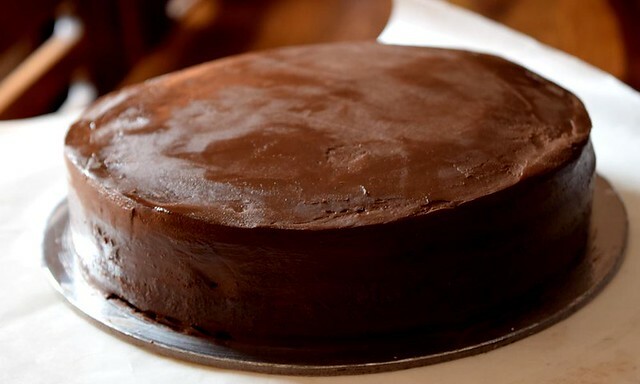 Cover the cake with ganache. Keep the cake in the refrigerator for 15 minutes. After 15 minutes take it out and using a scrapper, smoothen the sides. Add your choice of chocolates to garnish the cake. And here is your whole-wheat eggless death by chocolate cake ready to serve. Slice and cherish it. This is going to be your best ever moist and eggless homemade death chocolate cake. 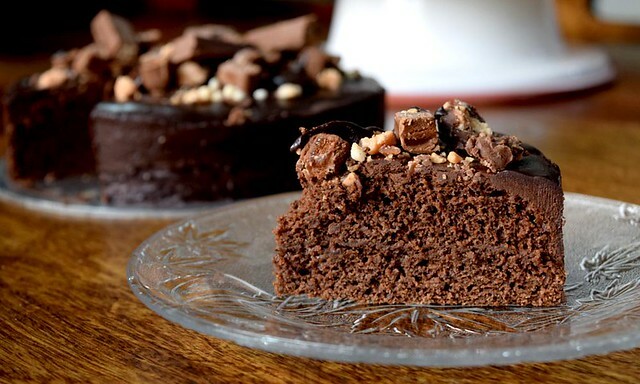 Best ever Moist and Eggless Homemade Death Chocolate Cake recipe. Be ready to see your loved one's heart melting as they eat this melt-in-mouth chocolate cake. 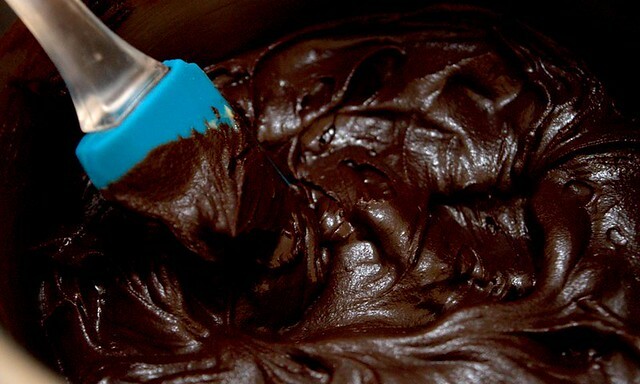 For ganache, Take fresh cream in a non-stick pan and bring the cream to boil. Switch of the flame and add chopped chocolate to hot cream. Stir it and add butter. 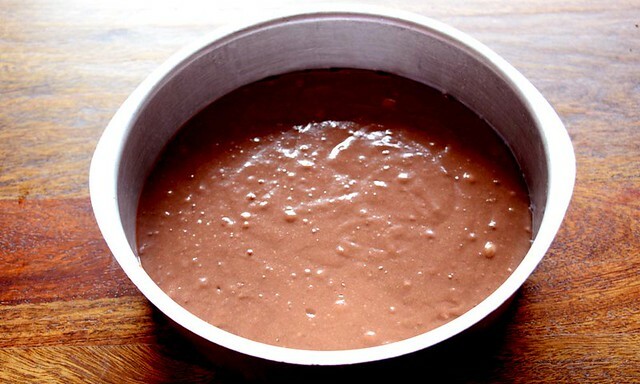 For cake, In a bowl add condensed milk, oil and vanilla essence and mix all the wet ingredients. With the help of a sifter sieve flour, baking powder, baking soda, cocoa powder and salt. Meanwhile keep your oven for preheating at 180 °C. 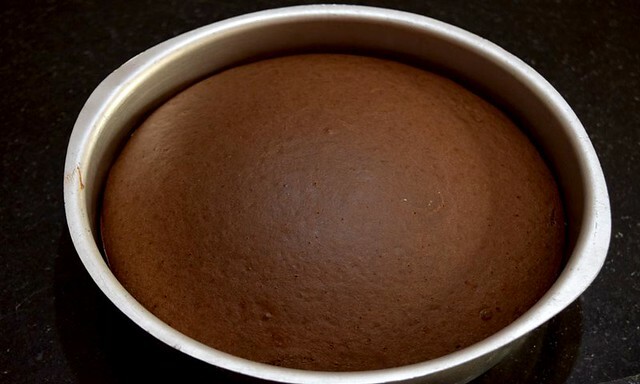 Pour the prepared batter into the greased cake tin and bake it in preheated oven at 180 °C for 25 minutes or until it passes the toothpick test. Once baked, take the cake out and demould it. After demoulding let the cake rest on cooling rack for minimum 1 hour. Once the cake has cooled down, cut the cake horizontally into two equal halves. Place one piece of a cake board. Keep the cake in refrigerator for 15 minutes. After 15 minutes take it out and using a scrapper, smoothen the sides. Add your choice of chocolates to garnish the cake. And here is your whole-wheat eggless death by chocolate cake ready to serve. Slice and cherish it. While making the chocolate ganache, everything should be at room temperature. After preparing the ganache, cover it with cling wrap to avoid crust formation and let it cool. Sifting the dry ingredients in an important step, do not skip it. After adding dry ingredients to wet ingredients, do not over mix the batter. All the ingredients e.g. Baking powder, baking soda, Vinegar should be in their “Best to use “time period. This is a tried and tested recipe. Any change in ingredient or its measurement can change the final result as well. You can bake this cake in Microwave Convection at 180 °C for 20 minutes or until it passes the toothpick test. You can bake this cake on a gas stove, in a pressure cooker on medium flame. It will approximately take 35- 40 min. If you like extra moist crumb, you can brush the cake sponge with sugar syrup while assembling it. However I don’t like extra sugar in my bakes, so I skipped it. Can we use all purpose flour instead of wheat flour ?? Yes, you can replace whole wheat flour with all-purpose flour. The recipe card has the adjustable servings feature. Try that and you will be able to adjust it to the number of people you want to make it for. What is the difference between normal ganached chocolate cake and death by chocolate cake?? 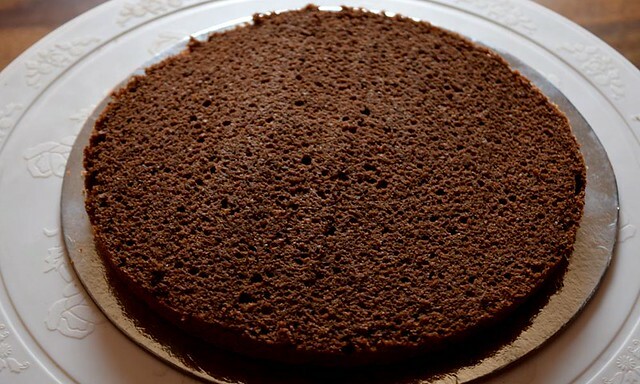 Please search for chocolate cake recipe on my blog. You will be able to clearly see the differences. Hi Sonia, can I use butter in place of oil. As sometime oil gives a different smell to the cake. Can you please share the brand of oil which you have used. Replacing oil with butter will change the texture of the cake totally. Can I use jaggery instead of milk maid ? This looks to be a wonderful recipe:). Want to try for sure. Can I knw what else can be used instead of vinegar? !…curd /lemon juice. Hello Priya, This is my tried and tested recipe. No substitute for vinegar. Thanks for sharing the recipe . would definitely make it.